In the Destiny 2 Black Armory DLC, a new world of weapons has been made available to Guardians everywhere. The Black Armory has opened its doors for the first time, and an unfriendly weapons maker needs your help. 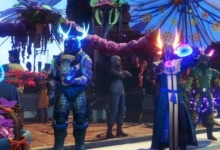 Along with the new Forge activity — not to mention new guns to chase —there is also an Exotic quest. The quest, simply called “Mysterious Box,” requires you to find four keys to open a crate found in the Black Armory’s first new major event: the Volundr Forge. The Volundr Forge is found inside of the Cabal base in the EDZ on Earth. Head there and make your way inside. Before jumping across the gap to make your way to the Forge, look down to your left and you will notice a ledge you can jump on. Head down and inside the cave to find a chest. Open it and you will receive the Mysterious Box quest for the Lock and Key exotic. 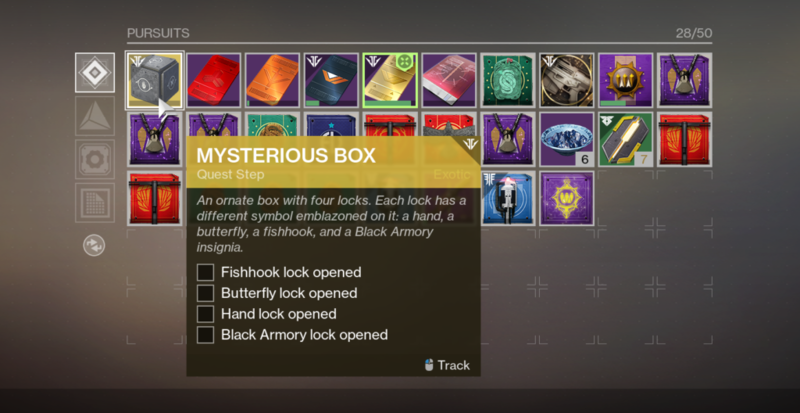 The box will task you with opening four locks: a Fishhook lock, a Butterfly lock, a Hand lock, and the Black Armory lock. 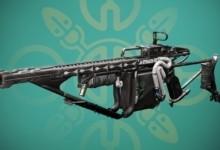 Three of the locks have to do with the three Forges set to release within Black Armory, while one has to do with the Black Armory itself. The first lock available to open is the Fishhook lock, which is the symbol of the Volundr family. This lock is tied to the Volundr Forge where the Mysterious Box is found. To get the key for the Volundr lock, you must destroy two round, blue robot… things that spawn inside of the Forge while it’s fired up. The first is found floating around above a landmass out in the water near the Forge — to the left of where you first enter. Take out a sniper or scout rifle and shoot it. The second blue bot is found opposite the first. Turn around after shooting the left-hand drone and you should see its partner floating around inside of the cave in the distance. This video by YouTuber Esoterickk was the first to pop up showing the locations of the bots. Once both bots are shot down, you must finish firing up the Forge. When it’s finished, head to the chest behind the Forge that looks just like the one you found the Mysterious Box in. You will be rewarded with a Black Armory Key that has a Fishhook symbol on it. Use the item and the first of the four locks will open. 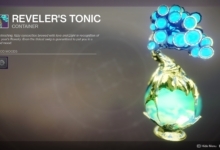 The second of four keys is found in the Gofannon Forge on Nessus. It’s found the same way as the first, by shooting two bot drones in between the first and second wave. The first one spawns in the back left of the arena, and the second spawns towards the entrance. Shoot them both and the key will spawn in the chest once the ignition ends. The third lock is, you guessed it, in the third Forge — the Izanami Forge, also on Nessus. 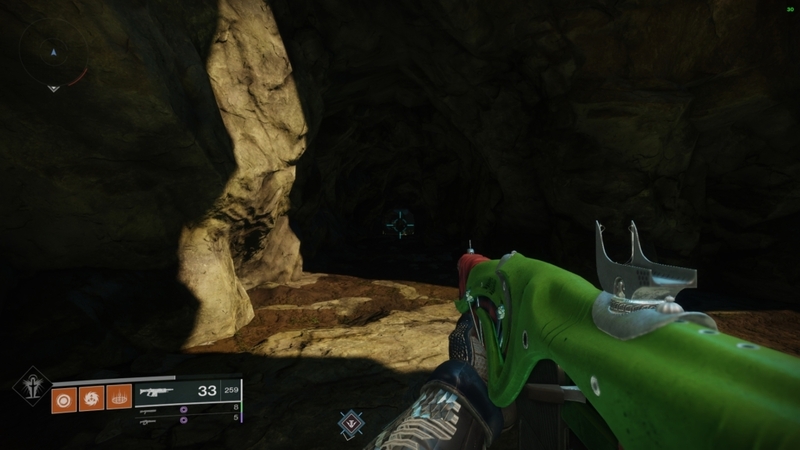 The drones in this Forge are found on the two side islands in between rounds one and two. Shoot them both and grab your key once the Forge ignites. The final lock is opened with a somewhat lengthy quest that became available once the fourth forge was opened. 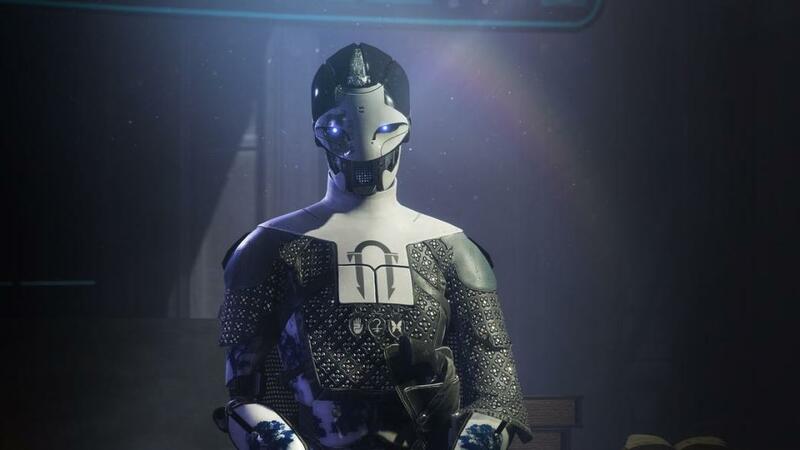 First head to Ada-1 and she will give you a quest for the Black Armory Key Mold. Up first, you will have to head to the Leviathan in Nessus’s orbit and farm some Watchers in the ship’s underbelly. Drop underneath the main entrance platform when you first land and you fill find six levers. Number them one through six, then pull them in this order: 1 – 5 – 3 – 2 – 4 – 6. This will open the way into the underbelly, which is found in the sewers below the main entrance into the ship. Go to the engine room, which is found by following the first left once you get into the underbelly, and farm yourself some Watchers. They are the little tank things that shield themselves once you’re spotted, but become vulnerable once you kill all of the adds that come in. You need 24 Watcher Lenses to continue. Up next is 200 Glimmering Amethyst, which can be found in public event chests, Strike chests, and supply caches. We suggest farming the Lake of Shadows Strike on EDZ, which can be speed-run in about 4-5 minutes. Completing the Strike will get you 10% of progress at a time. Now it’s time to go to the fourth forge, the Bergusia Forge, found in Niobe Labs in the EDZ all the way to the south. You’ll once again have to shoot two drones to get the Maximum Temper buff to finish the key. One drone spawns near the left side of the area by the ruins, and another on the right. Just keep your eyes peeled after the first round. Once the Forge is ignited, open the chest that spawns, and you can open the final lock which gives you…another quest. Take the new item to Ada-1, who will decipher it for you. Sadly, the first step of the quest is a bit of RNG. You will need to finish a Rare Black Armory Bounty, which only drops at random from finishing other Black Armory bounties. So it’s time to farm them until one drops, and then finish that bounty, too. Doing so will give you an Obsidian Crystal. Consume it into the Device, and it will evolve. 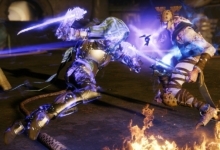 Up next is a visit to the Shattered Throne dungeon, which can only be found on week three of the curse cycle in the Dreaming City. Finish the dungeon, and the penultimate step is a difficult variant of the Pyramidion Strike on Io. 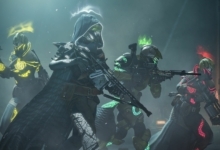 Now you should have an Unidentified Radiant Frame, so return to the EDZ for a mission called “Lock and Key” inside the Bergusia Forge and have one final battle with Siviks, Lost to None. Once he is dead, the forge will give you an item called Not A Weapon. Take it back to Ada-1, and she will give you…a really good weapon. 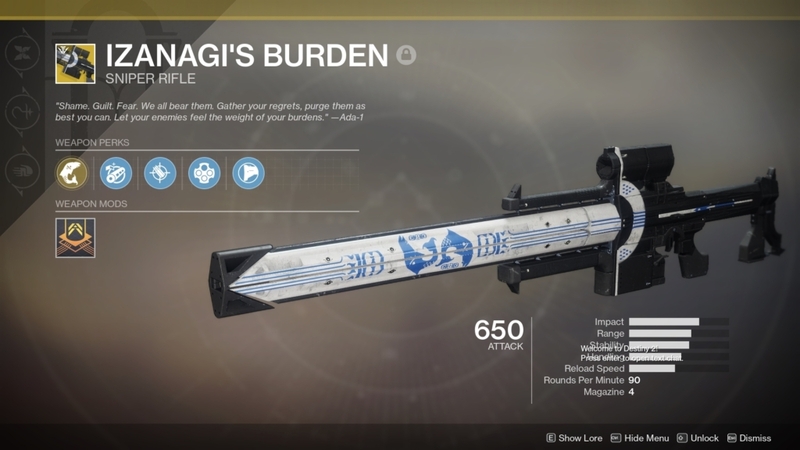 The prize of the Lock and Key quest is the Izanagi’s Burden sniper rifle.